SVE System Rated at 2,000 SCFM at 11"Hgg - pdblowers, Inc. 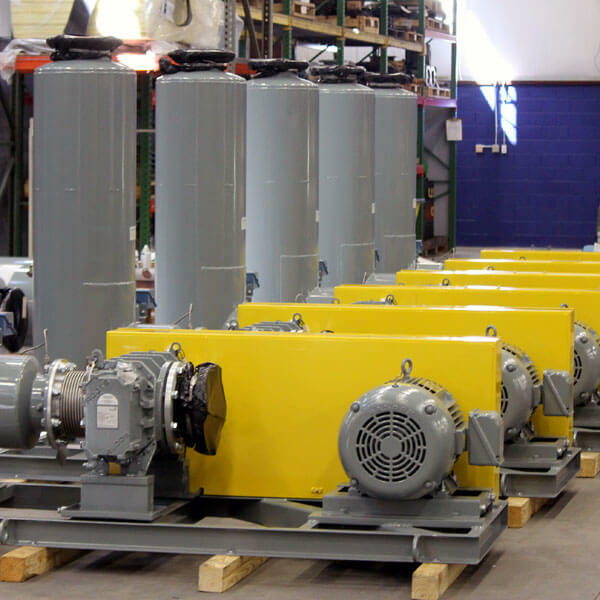 The customer planned to vary the speed of the vacuum pump with a variable frequency drive (VFD) to meet the demands of their system. The vacuum system was designed for a maximum back pressure of 3 psi since the discharge would be passed through a heat exchanger and then into carbon vessels. 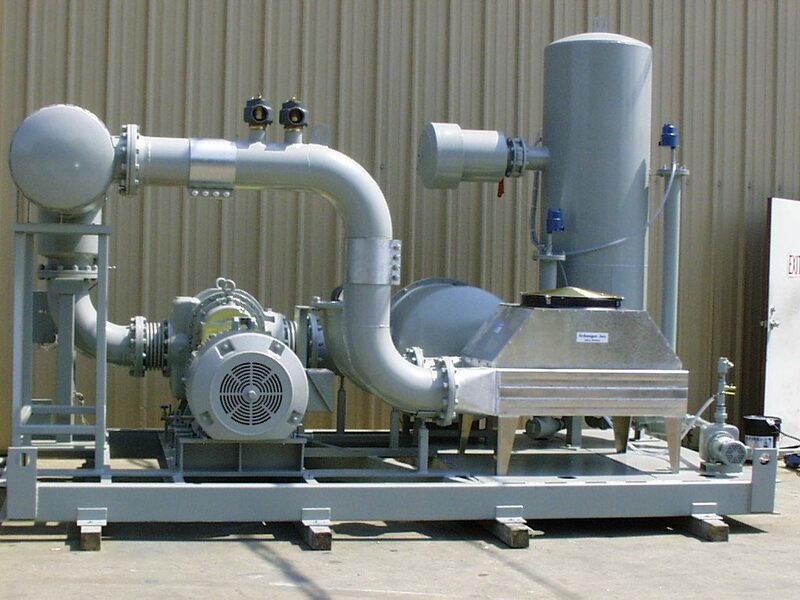 The heat exchanger is an air-to-air type that can achieve cooling to within 10 to 15°F of ambient air temperature. Pressure and temperature transmitters were used to insure that the maximum operating conditions of the vacuum pump were not exceeded. The vacuum pump was direct connected to the 200 HP inverter duty rated motor. 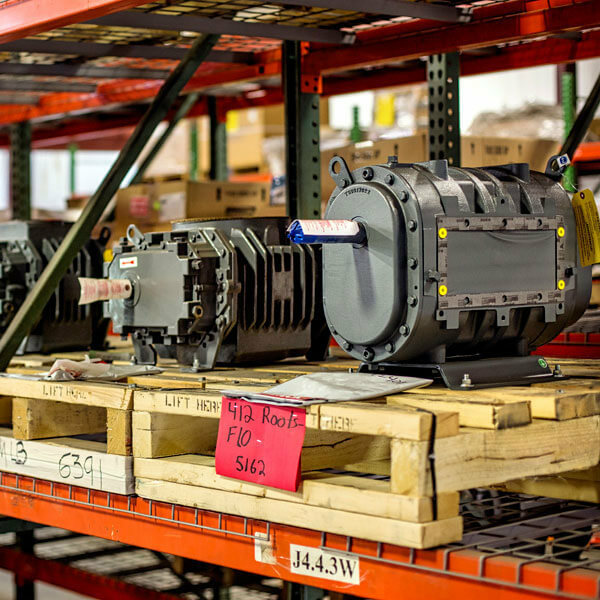 Direct connecting the unit provides the longest bearing life on both the vacuum pump and motor and eliminates the need for field tensioning of v-belts. V-Belts exert a side load on blower and motor bearings and reduces the overall life of the bearings. An inlet particulate filter is located between the air/water separator and vacuum pump to eliminate large particles from entering the vacuum pump and potentially causing harm. Note that both inlet and discharge expansion joints are used to isolate the blower from the fixed piping. This limits the amount of stress that can be imposed on the vacuum pump flanges. Excessive stress can cause a distortion in the vacuum pump cylinder causing a loss of clearance and possible contact of the impellers to the cylinder. 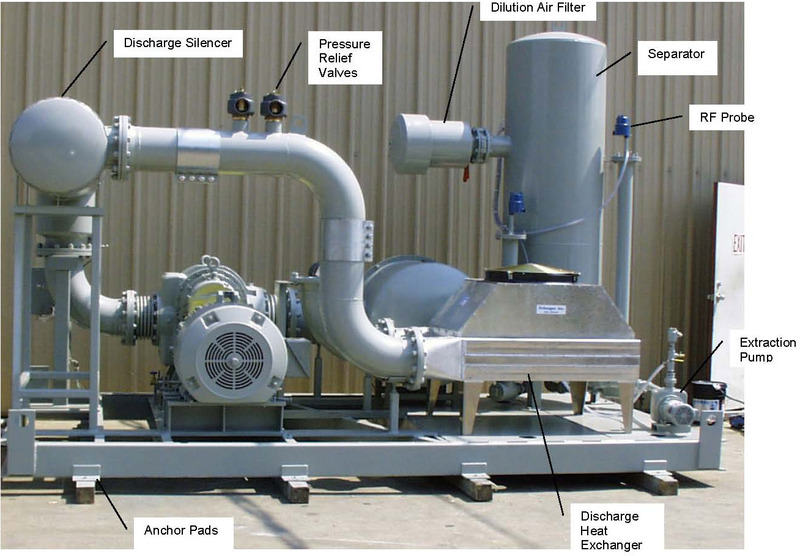 The discharge silencer is used to reduce noise and pulsation from the vacuum pump. This particular silencer also features “lagging.” Lagging is a layer of insulation with a steel shell. It helps reduce the noise emitted by the shell of the silencer as well as providing personnel protection from excessive heat. Mechanical relief valves were supplied on both the inlet and discharge side of the vacuum pump to prevent damage to the unit should the set points be exceeded. Instrumentation provides the first line of defense from excessive inlet vacuum and discharge pressure, but the vacuum relief valves provides a secondary mechanical protection. All rotary lobe positive displacement vacuum pumps should have mechanical safety relief valves. pdblowers designs its systems to be maintained and easily disassembled should removal of a component be required. We design a system keeping in mind the features we would want if we were to maintain. Many times we have been asked to service equipment manufactured by other system integrators that have not designed the system to be easily maintained. 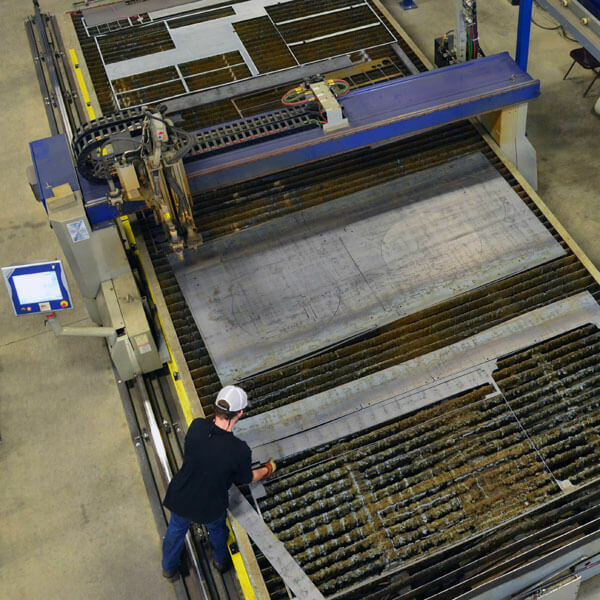 The result typically is much higher maintenance costs. The system may be less expensive during the initial purchase but is much more costly to maintain. 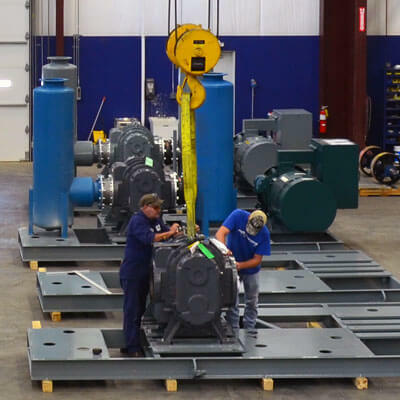 Since the system is controlled via a variable frequency drive, it is critical to perform a Torsional Analysis on the vacuum pump and motor assembly to insure that the unit is kept out of an excitation speed that could cause destructive vibration. pdblowers has the ability to test systems up to 250 HP to insure that when the system is received on site, it is ready to run. Performance for this system is provided for your reference. Detailed call outs of various components can be reviewed as PDF files in the “Related Documents” section below. If you have performance or component needs that are similar, please keep this concept in mind as one of many of the configurations that are available to meet your needs.